If you have dry skin, you might not have found that perfect product that will give you the extra hydration you need without overdoing it. 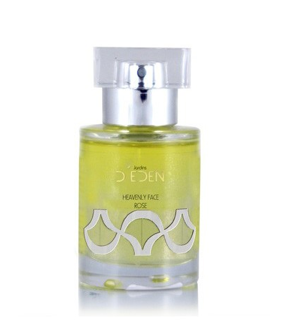 If that’s your story, you might want to try out the Heavenly Face Rose Elixir from Jardins D’Eden. It’s an oil that has been formulated to be used as both daily and night treatment depending on how dry your skin is. The oil is a blend of essential oils of Rose (which is toning), Frankincense (which is rejuvenating) and Geranium (which is regenerating). Presented in a spray this elixir is lighter than other face oils I’ve tried. It also contains Sweet Almond Oil, Rosehip Oil, Jojoba seed Oil, Borage Oil and Evening Primrose Oil, packed with nutrients for your skin. I love the scent of this product, because although its main component is rose there is also a subtle geranium after-scent that is very fresh and uplifting. And the glass bottle it comes in is beautiful and very elegant indeed! There are two other face elixirs in the range: Heavenly Face Yling Yang – for combination to oily skin – and Heavenly Face Neroli – for all types of skin. Our facial elixirs are 100% natural base and essential oils, formulated for the daily care of the skin or as a night treatment. A blend of softening Sweet Almond Oil, nourishing and Vitamin A rich Apricot Kernel, anti-oxidant Rosehip Oil, sebum balancing Jojoba seed Oil and healing Borage Oil. Find out more on www.jardinsdeden.co.uk. The Facial Elixirs are priced at £28.00. This entry was posted in Skincare and tagged essential Oils, evening primrose, face oil, geranium, heavenly face rose, Jardin D'Eden, jojoba, rose, rosehip. Bookmark the permalink.